Let us memorialize the deaths of 20 innocent children in Connecticut by finally addressing the issue of gun control in this country. When will we no longer allow the National Rifle Association to be the only decision maker to decide how we control guns? Something needs to be done. 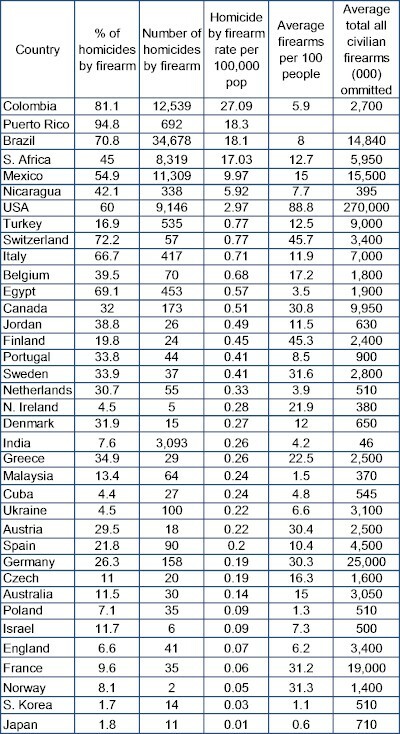 Below is an excerpt from an article appearing in the Guardian on July 22, 2012, Gun Homicides And Gun Ownership by Country, comparing murder rates by country. • Puerto Rico tops the world's table for firearms murders as a percentage of all homicides - 94.8%. It's followed by Sierra Leone in Africa and Saint Kitts and Nevis in the Caribbean"
I extracted the data below from the above article and tried to include those countries that were most relevant when comparing them to the United States. My conclusion is the United States has a serious problem. The United States had 88.8 firearms per 100 people. The next closest country was Switzerland with 45.7 per 100 people. Switzerland's homicide by firearm per 100,000 in population was .77 while ours is 2.97. This problem needs to be addressed. In this article I am not advocating gun control. I am advocating that serious thought be given to what we are going to do about it. Gun control is only one solution and the NRA should not be allowed to be the sole decision maker on this important issue. 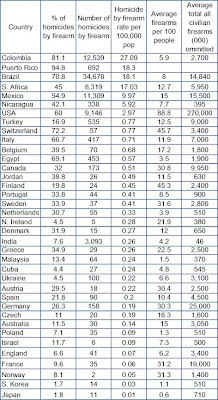 Look at the countries above that have higher homicide rates by firearm than the United States. Except maybe for Brazil, the remainder of the these countries we would expect to have higher murders per capita than the U.S.. I used to be a proponent of total gun control but I have changed my position some time ago. While a terrible and high profile tradegy as this shows the danger of legally obtained guns failing into the hands of mentally disturbed people with violent intent, the vast majority of gun crimes are committed by the criminals. Disarming the law abiding citizens (who account for the small percentage of all gun crimes) would do very little to stop these crimes, and would only make it easier for the criminals to assault people without any fear of retribution. You can only count on the police to show up after the crime has been committed. The fact is, the USA had traditionally been a more violent country than the UK. Looking at the countries like Russia or Mexico where there is gun control and a very high murder rate, or Washington DC where it's practically impossible for a law abiding citizen to own a gun yet the gun violence is very high, shows that the gun ban in a violent society is never going to work. Just like drug ban doesn't. It appears that many of the adults shot at the school died trying to stop the shooter with their bare hands. Had at least one of them been armed, the events could turn out differently.